Now you can remove the “orange” look from older vinyl dolls. How many times have you bought a new baby to reborn but discovered she was so yellow that she looked ill? She was a cute sculpt but the vinyl color really hurt her good looks. 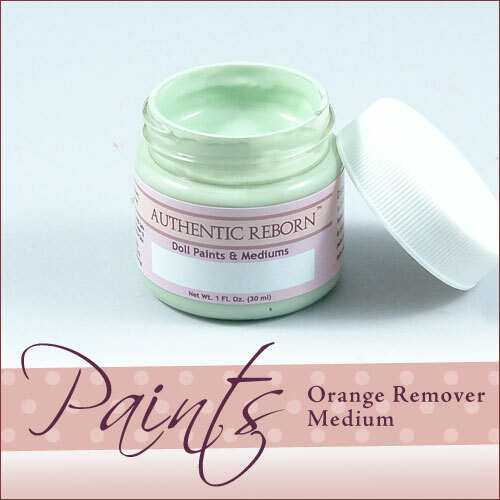 Now you can remove that “orange” with Authentic Reborn’s new Orange Remover. Use our new mushroom sponge to easily apply this heat set paint to your orange baby. One even coat and your orange is gone leaving your baby’s skin a soft gentle flesh color. When heat set properly Orange Remover is permanent and will not come off even if you rub it with odorless thinner.